Here we are, almost half way through October and today I think one could be forgiven for thinking it was July. What a lovey day! Blue skys, very gentle breeze, glorious sunshine and ooh... just lovely and warm. 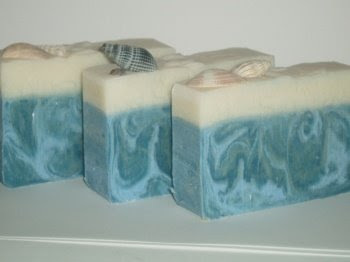 It is days like this that make you think of the seaside rather than pumpkins and, although I didn't even get close to the beach (unless you count 100 miles as being close) I do get a little taste of the beach with this lovely soap, Coquilles de mer by LCR Soap Company. No, no, no.... Thank YOU!! I love this soapie. 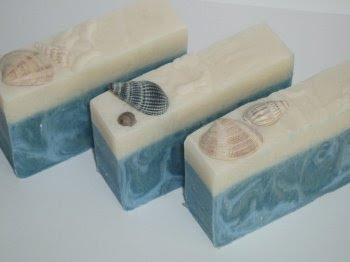 It has clearly been made with so much attention to detail and it really does give you a lovely seasidey feeling - warms the cockles, lol!! !